Catching up on what I ate Sunday and Monday on Engine 2! My Sunday morning started with a Folded Chickpea Omelet from The Engine 2 Cookbook. This is essentially pudla — chickpea flour pancake — stuffed with oil-free, sauteed mushrooms, spinach, and onions and topped with tomato, salsa, and avocado. So good! I'd eat this again and again. My friend Andy asked me to help him cook for his church on Sunday. Not my thing, but I owe him for all the pet-sitting he does for me. I made vegan pigs in blankets and some of my vegan pimiento cheese (from Cookin' Crunk). Neither would be Engine 2-approved, but I snacked on those things anyway as we prepped the food. Then my parents came over Sunday afternoon for a late Mother's Day dinner since they were out of town on actual Mother's Day. My dad brought some Seva Foods Space Ice Kream that he ordered me. It's cashew and coconut milk-based vegan freeze-dried ice cream! Fun! I tried this, which I would think is pretty healthy since it's just made with coconut milk, vanilla, and cashews. Then we went to Genghis Grill for dinner. My parents love this build-your-own stir-fry chain! I tried to assemble the healthiest thing I could. I ordered a small bowl since that's plenty for a serving. I added tofu and every vegetable I could fit in, and for my grain, I picked brown rice. I chose the Sweet & Sour Sauce because it's one of only a couple sauces there made without HFCS. Still has a lot of sugar and sodium though! After my parents left, Paul and I went to our friend David's house and had a few beers (Memphis Made Fireside) on his back porch. So other than breakfast, I didn't follow Engine 2 that closely on Sunday. But I made up for it on Monday! 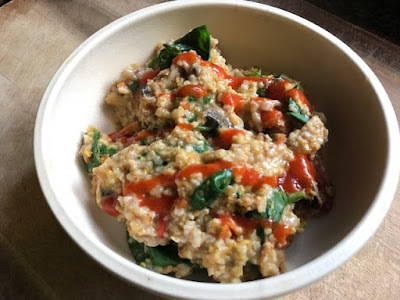 The day started with Savory Oats from The Engine 2 Cookbook — oats with nooch, mushrooms, spinach, sundried tomatoes, and turmeric. Mmmmmm. Morning snack was Roasted Cashews. I had a meeting that ran very long, so I snacked on these until I could get to some real lunch. I'd intended to go home to eat lunch, but since my meeting ran long, I didn't have time. Luckily, I work in a building filled with vegan food options. I chose the healthiest meal I could find — Superfood Salad from Farm Burger. This has kale, dried cranberries, pecans, beets, nooch, and tahini dressing. The salad is only lightly dressed though and doesn't seem oily at all. By the way, Farm Burger now carries the Impossible Burger! So I'll be back for that VERY soon. It was a little hard to order a kale salad when the Impossible was an option. Afternoon snack was Bell Pepper Slices with Oil-Free Hummus. And finally dinner! Dinner was so amazing. I made the Snappy Black Bean Soup from The Engine 2 Cookbook. This soup has a base of pureed black beans and lentils, and it's just fantastic. There's a whole cup of salsa in the recipe, which adds awesome flavor with no need for added salt. It has also has fresh-squeezed OJ for a touch of citrus. I made some oil-free tortilla chips to crumble on top using corn tortillas cooked in the air fryer. That’s so generous you helped cook for your friend’s church, both dishes sound like great crowd pleasers. I totally see the appeal of choose your own stir fry! I get random cravings for sweet and sour sauce about twice a year, even better with tofu. When I saw your black bean soup on Instagram I almost drooled! I love the idea of adding some orange juice! Everything looks so good! That stir fry looks awesome, stir fries are my favorite! How fun that they have vegan space ice cream! The black bean soup looks incredible. I feel like I have to check out this cookbook. It'll be helpful for my detox!